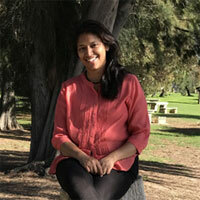 Vidushi Amit Patel is a PhD Candidate in the School of Agriculture and Environment at The University of Western Australia (UWA). Her research is looking at the impacts of environmental pressures on commercial beekeepers’ hive migration patterns across Western Australia using spatial multi-agent modelling approach. She has done MSc in Geology and MSc in Geomatics from India. She has worked as a Research Associate at the Centre of Environmental Planning and Technology University (CEPTU), India. She has a strong working experience in the application of Geographic Information Systems (GIS) and Remote Sensing technologies to the natural and built environments. Her research interests has expanded after moving to Australia and she is keen to apply her existing knowledge to understand the interactions between natural and social systems.